Cheshire Cat dress. Includes: Dress with attached Tail, Shrug, Ear Headband, Wrist Covers, Knee High Stockings. Who is that mysterious cat that is always grinning? It’s the Cheshire cat of course! Now you can be the cheeky cat that is sometimes up to no good when you wear this adorable Child Sassy Wonderland Cat Costume! Thigh high stockings with turquoise stripes, in case you’re going for Tim Burton’s Cheshire Cat look. One-piece Cheshire Cat jumpsuit for kids that zips up the back. 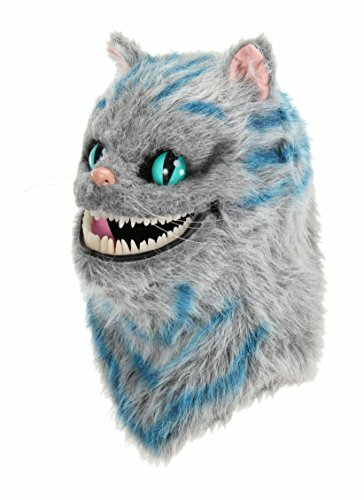 Very detailed Cheshire Cat mask, made of faux fur. It has a moving mouth that sits along your jawline inside and talks in perfect unison with you! 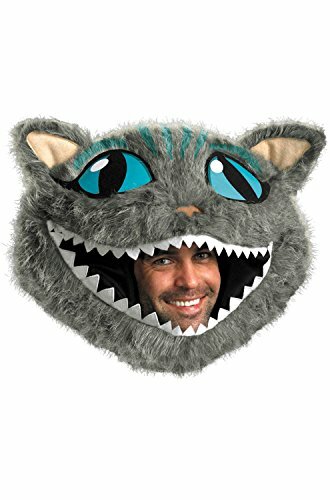 Oversized Cheshire Cat mask, based on Burton’s visualization of the Cat in his movie. Cozy and warm striped Cheshire Cat fleece dress with zipper front, cat ear hood and tail.